You’ve seen a normal electric car charging station, right? The charging infrastructure isn’t really there yet, but it’s still likely you’ve seen one. They tend to be some sort of wall-mounted box or free-standing obelisk-like thing with a long, thick cable, terminating in the plug that connects to the car. They’re electron-pumping versions of gas pumps. This is a lousy way to design them, and I think I have a better idea. 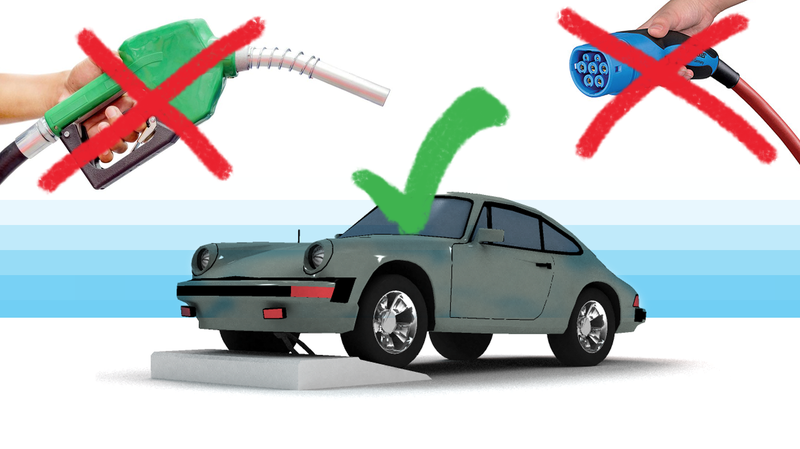 There’s an awful lot wrong with most charging stations because it seems like, consciously or otherwise, they’ve all been patterned after what we already know: conventional fuel pumps. There’s no real reason an electric charging station has to look like this; cables, especially those thick, well-insulated EV charging cables, are awkward, clumsy things, a pain to pull off and plug in, a pain to have to coil back up and replace on the charger. Often, people don’t even bother doing this last step, and cables and connectors are just flopped on the ground, where they can get damaged. It’s not great, by any means, and there’s no reason why this has to be. Why should you even have to exit your car to connect to a charger? You shouldn’t have to. You should be able to just pull in to an EV charging spot, and everything just happens. That is crazy overkill, and also kind of nightmarish. What there needs to be is something simple, rugged, usable by as many cars as possible and as easy to use as just pulling into a parking spot. Here’s how I think you could do it. This re-thinking of chargers does require changes on the car side, too, specifically the location of the charging port and, ideally, this location would become a standard that all carmakers would agree on. The traditional plug-and-cable charging ports could be maintained as well, for backwards compatibility or whatever, but all future EVs would need this common standard of charging port, which will be located on the underside of the front of the car. I’m thinking EV chargers should be low things mounted right to the pavement that you just drive right up onto. There would be a shallow ramp, with generous tire guides, that you’d use to line up your car and drive on. As you drive up the little ramp, a spring-loaded arm, long enough to reach SUVs with a high ride height and lots of ground clearance, would slide along the bottom of your car, in a small channel specially designed for this purpose, until the connector end meets a matching connector on the bottom front area of the car, usually right behind the front bumper, a bit further back for lower cars, to get the arm at the right angle. Once the arm connector makes contact with the car’s socket, the design of the socket housing slides back a spring-loaded weather-protecting cover from the plug, and the plug connects to the car’s charging socket, with the tension from the spring arm keeping good contact. This is the most simple, mechanical way to do it; you could put the connector on a powered arm that automatically raises and retracts, but I bet this could be accomplished with just a spring-loaded system, too. Either would work, though a powered arm might subject the connectors to less wear and tear from sliding on and off. I’m thinking the only interface really needed could be handled through either a user’s phone with an appropriate app or right on the car’s own dashboard displays. A set of standards would be agreed upon for talking to the charger, which could be accomplished through direct data lines in the connector or Bluetooth to a phone, and this could handle payments, charge status, timers, whatever. If you really want the charger to have its own display of some kind, you could just have a little display I/O unit on a post by the charger. This type of configuration would let you just pull onto a charger and go. If it’s raining, no getting out of the car and wrangling thick, heavy electrical cords in the wet. No having to coil cables and hang them back up. No flaps to find or cables to pull out of the trunk or clunky connectors to fight with. If the EV has been raised dramatically or is shaped in such a way that the arm just can’t reach an underside charging port, then these could have conventional sockets for EV charging cables that, if you had such a car, you’d know to keep with you. But, for the vast majority of cars, a design like this could be built with enough play and flexibility in the connector and arm design to be pretty damn universal. When you’re ready to leave, you tell the charger you’re done via your phone or car, and the arm—whether it’s powered or spring-loaded, could be retracted slightly by a small-motor powered mechanism to break the connection, electrical and physical, and the EV driver could just then back off the ramp and out of the spot. Easy! Maybe you wouldn’t even need a retraction motor—the right connector design could allow it to slide out, or the weight of the wheel rolling back could actuate a clever mechanism, or something. I’m not an engineer. I feel like these should be cheaper to build and require less maintenance than conventional chargers, since there’s a minimal number of parts that require direct human handling. It could work in parking lots or garages or wherever. I can even imagine portable ones being built that you could just drop down anywhere they’re needed, and connect them to a power source. What’s not to like about this? Smaller, cheaper, better, easier! Time to give up out outmoded ideas about what it means to replenish your car! The only thing we have to lose are our chains! And by “chains” I mean cables. I can't wait to hear about what a moron I am!